Reconstitute with 10 ml of sterile water for injection I.P. It is a freeze dried monovalent antivenin to treat sting victims of red scorpion (Buthus tamulus) It can be stored at room temperature. On reconstitution it’s a solution of enzyme digested, refined antibodies prepared from equine blood. Available in vials. Water for Injection is provided for reconstitution of the freeze-dried Powder. Adverse Drug Reaction : Occasional sensitivity reactions, acute anaphylactic shock which needs immediate treatment. Sensitivity tests should be done whenever possible before administration. Antihistamines and treatment for anaphylactic shock should be kept ready. 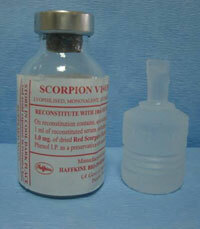 Scorpion Antivenin IP is of equine origin derived from the plasma of the horses, ponies, mules, etc., that have been hyperimmunized against the venom of Red Scorpion(Mesobuthus tamulus concanesis, Pocock)earlier called as Buthus tamulus. Serum obtained from plasma contains purified, enzyme refined and concentrated specific heterologous immunoglobulins. It is used as a passive immunising agent and affords protection to the susceptible victims against the sting of Red Scorpion (Mesobuthus tamulus concanesis, Pocock). 1ml. of the reconstituted 'Scorpion Antivenin IP.' neutralises 1.0 mg. of dried Red Scorpion (Mesobuthus tamulus concanesis, Pocock) venom. It also contains 0.25% phenol IP. as preservative. The moisture content in the lyophilised 'Scorpion Antivenin IP. does not exceed 1 per cent. The Scorpion Antivenin IP. is indicated for all stings caused by Red Scorpion (Mesobuthus tamulus concanesis, Pocock) venom where patient presents with clinical signs and symptoms of envenomation. B. PRECAUTIONS TO BE OBSERVED BEFORE ADMINISTRATION OF SCORPION ANTIVENIN IP. Elicit history of familiar allergic disorders such as asthma, eczema, drug allergy from the patient. Whether he had received earlier, injection of serum such as antitetanus serum, antidiphtheria serum etc. Carry out the sensitivity test on the patient. Inject subcutaneously 0.1 ml. of the serum diluted 1:10. Observe the patient for 30 minutes for local or general reactions, if any. In the absence of adverse reactions, administer the requisite dose by the chosen route of injection. Keep handy injection Adrenaline (Epinephrine) 1 ml. 1:1000 along with antihistamines and steroids to meet any emergency arising out of sensitivity reactions. After administering the full dose of serum, the patient should be kept under observation for atleast 30 minutes. If a patient is found sensitive to the equine antiserum, you may desensitise him by administering graded dose of the anitserum at regular and adequate intervals. Before desensitising the patient the doctor has to decide whether serotherapy is really needed. In sensitive individuals where the time factor is of paramount importance, it is advisible to administer Scorpion Antivenin IP. under the cover of Inj. Adrenaline (Epinephrine) 1ml. (1:1000)i.m. antihistamines without awaiting the results of the test dose. There are no known contraindications for the administration of Scorpion Anitvenin IP.